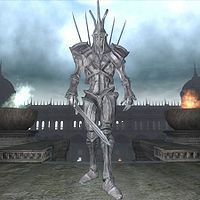 Jyggalag is the Daedric Prince of Order and the primary antagonist of the Main Quest of Shivering Isles. As the leader of the Forces of Order, he attempts to invade the Shivering Isles every era, an event known as The Greymarch. Since Jyggalag has never been unsuccessful in his invasion, the Greymarch always ends with the total destruction of the realm, leaving Jyggalag and the Forces of Order to disappear and Sheogorath having to restore his realm. You are chosen by Sheogorath to act as his champion, who is to stop the Greymarch and therefore save the realm. Sheogorath will add: "The Daedric Prince of Order. Or biscuits... No. Order. And not in a good way. Bleak. Colorless. Dead. Boring, boring, boring. And not a fan of My work, I can tell you. Hates it. Hates Me. A bit single minded, if you take My meaning. You've seen his Knights. Not the warm and cuddly sort. Not a bit of original thought in their lifeless husks. So, you're going to help Me stop him." Sheogorath's Chamberlain, Haskill, will add: "The Daedric Prince of Order, and the leader of the Greymarch. As I'm sure my Lord told you, Jyggalag has always been a threat to this Realm." Comparable to Mehrunes Dagon in Oblivion, Jyggalag doesn't show up until the final quest in the Main Questline: The End of Order. Jyggalag is portrayed as a boring and unoriginal character as Sheogorath states: "Not a nice one. I don't think ANY of the other Princes like him, actually. I mean, Malacath is more popular at parties. And Malacath is NOT popular at parties." and "He doesn't even carry a cane! More the giant, bone-cleaving sword type of Prince." A feature which also applies to his tactics in battle as Sheogorath claims: "The Greymarch comes, and Jyggalag walks. Or runs. Never skips, sidles, or struts. Mostly, he just destroys everything around him." Haskill will add: "His appearance seems imminent. His hatred for this land, for what it represents, is unimaginable." In appearance, Jyggalag looks much like a giant Knight of Order, except he is much more powerful. 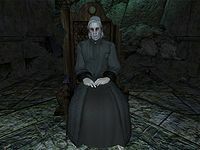 However, Sheogorath also admits that during every Greymarch, some citizens of the Isles will join the Forces of Order to become Priests of Order in an attempt to save their own lives: "It's annoying, to tell the truth. A bit hurtful. But they do it every time. Join up with the enemy, and become Priests of Order." Haskill will add: "Yes, he will soon march across the land, destroying all that stands in his path. It's a frightening prospect. Many of our citizens are... delicate. They can't cope with the prospect, and they defect to the forces of Jyggalag, becoming Priests of Order." Indeed, during the Ritual of Accession, the surviving Duke will join Jyggalag's forces, marking the first time a Duke has ever betrayed Sheogorath. If Jyggalag reaches the Throne of Madness, he wins the Greymarch. As you progress through the Main Quest, Sheogorath admits: "I'm never here when Jyggalag walks. It's one of the Rules. ", leaving the throne empty and undefended. It is Sheogorath's plan to turn you into a new version of himself who can defend the throne against Jyggalag: "A Me to fight the Him. Since I won't be around. It's simple, really. If you don't think about it." Eventually Sheogorath will eliminate any suspicions by explaining the real reason behind his departure: "Because He is Me! I'm Him! We're a bit of each other, really. I won't be here when He arrives, because I'll be Him. Happens every time. The Greymarch starts, Order appears, and I become Jyggalag and wipe out My whole Realm. [...] But you're still going to stop the Greymarch. Stop Jyggalag... Me... from destroying My Realm." And Sheogorath's new plan seems to work, as is clear at the start of The Helpless Army quest, in which Sheogorath is particularly excited about Order's attack on Brellach/Pinnacle Rock: "It means Order has tried subterfuge... not its strong suit. Amazing! Perhaps things aren't going as poorly as I'd imagined." Jyggalag's ending monologue is spoken by a disembodied NPC with editor ID SEJyggalagVoice, who is of the Sheogorath race. Although Jyggalag appears to wield a sword, it is actually a part of his character model. This means he uses Hand-to-Hand combat, which can be confirmed by the fist sound effects that can be heard when he hits you. It is during the Symbols of Office quest that Jyggalag takes form as Sheogorath vanishes, while saying the words: "The realm is dead! Sheogorath is dead!! All shall crumble before Jyggalag!" 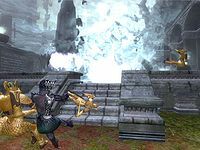 Haskill will send you towards Knifepoint Hollow to recover the secret to create the Staff of Sheogorath, which is to hold the power of Sheogorath in order to stop Jyggalag: "The ruins of Knifepoint Hollow once served as a great library. There, you will find a door. Behind that door, you will find the answer you seek. Although... I hesitate to guide you towards this path. The secrets of the past will surely aid Jyggalag, but I fear that we have no other choice. Be mindful of what you find there. The library is a thing of Order, and it will still serve that end." There you will find Dyus, an ancient immortal man who is said to represent all knowledge. He will explain his existence: "Your predecessor cursed me with immortality and placed me in this remote location in order to "protect His Realm from my knowledge." In truth, I was Jyggalag's trusted chamberlain and the keeper of the great library. He could not bring himself to destroy the knowledge that I represent, which is to say, precise predictions of all that is, has been, and will be." He explains that Knifepoint Hollow was once the great library of Jyggalag: "The great library was the height of logic and deduction. Contained within its walls were the formulaic predictions of every action ever taken by any creature, mortal or Daedric. Every birth. Every death. The rise of Tiber Septim. The Numidium. Everything. All predicted with the formulae found within Jyggalag's library. When Sheogorath discovered the library, He had it burned, insisting that it was an abomination and that personal choice defied logical prediction. I am all that remains of the knowledge contained within the great library of Jyggalag." After having retrieved the items Dyus explained are needed to create the Staff of Sheogorath, Jyggalag's Chamberlain will ironically be the one to form the staff to be used to defeat Jyggalag, which leaves the Defender of the Realm to imbue it in the Font of Madness. When you've returned to the Palace however, starting The Roots of Madness quest, the Font will be contaminated as Haskill will explain: "Somehow the forces of Order have poisoned the Pools of Mania and Dementia that feed the Font. I suspect the traitor Thadon/Syl. Jyggalag has never had an original thought in his existence." He will add: "Jyggalag's minions must have introduced Order into the very wellspring of Madness. You must cleanse the Pools, or Order has won the war." When you explain that you've beaten Jyggalag at every turn, he will agree: "This is true. Very little surprises me, but your successes against the advance of Order have left me astonished. Speechless. Indeed, it is your very success that must have led Jyggalag to this unexpected avenue of attack. His usual approach is much less imaginative." Once the pools are cleansed, the Staff can be imbued in the Font of Madness, ready to be used for the final battle during The End of Order. 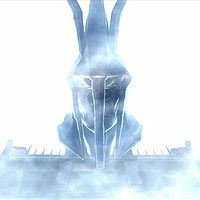 Autkendo Jansa/Aurmazl Zudeh will soon turn up and tell you about an Obelisk having been activated in the courtyard: "I expect that this is the beginning of the final assault. The cursed usurper Jyggalag himself may even take the field before the end." or "We will defend the Palace to the end of our strength, and will cast ourselves in the path of cursed Jyggalag himself should he come here." Haskill will add: "It seems that you've finally gotten Jyggalag's full attention. Cleansing the Tree seems to have convinced him that the direct approach was his only option." "You hold the staff, but you are no Daedric Prince!" "This ends as it always does. Order shall reign!" "Another of Sheogorath's foolish schemes!" "Your staff does not make you a Daedra, foolish mortal." "You wear the trappings, but you are not the Madgod!" "This is what the Madgod sends against me?" "Jyggalag walks once more!" "The Lord of Order shall rule this Realm!" "Are you the best the Madgod could muster?" "Bow before the power of Order!" "Kneel before the might of Jyggalag!" "Once again, Jyggalag walks!" "The Greymarch is upon you!" "A mortal to stand before Jyggalag? Fool!" "The Realm of Madness is mine!" "A mortal faces me?" "Shadow of a god!" "Break before the March of Order!" "Order shall rule this world once more!" If for some reason you feel obliged to summon Haskill at this point, he will remark: "I don't mean to point out the obvious... but isn't that Jyggalag right over there? He doesn't look very pleased to find you here, does he?" If that doesn't help, he will subsequently advise: "If you're finding Jyggalag a bit overwhelming in person, you might consider using your Staff. It may prove effective in this battle." Upon defeating Jyggalag, he will slowly vanish, marking the start of The Prince of Madness. Suddenly a burst of light will emerge above the center of the courtyard, and within it the head of Jyggalag as he shouts: "Enough! I am beaten. The Greymarch is ended. For millennia this drama has unfolded, and each time, I have conquered this land, only to be transformed back into that gibbering fool, Sheogorath. It was not always so. Once, I ruled this Realm, a world of perfect Order. My dominion expanded across the seas of Oblivion with each passing era. The other Princes, fearful of my power, cursed me with Madness, doomed me to live as Sheogorath, a broken soul reigning in a broken land. Once each era, I was allowed my true form, conquering this world anew. And each time I did, the curse was renewed, damning me to exist as Sheogorath. Now, though, you have ended the cycle. You now hold the mantle of madness, and Jyggalag is free to roam the voids of Oblivion once more. I will take my leave, and you will remain here, mortal. Mortal...? King? God? It seems uncertain. This Realm is yours. Perhaps you will grow to your station. Fare thee well, Sheogorath, Prince of Madness. " As his speech ends, he will disappear, leaving the realm to you, never to return. He will leave behind a trinket, however—the Sword of Jyggalag. It can be found on the pedestal at the back of the New Sheoth Palace throne room. Touch of Order - 10 - Absorb Health 2pts in 15ft for 1sec on Touch. Frost Damage 5pts in 15ft for 3sec on Touch. Throw Enemies. Touch of Order - 10 - Absorb Health 4pts in 15ft for 1sec on Touch. Frost Damage 6pts in 15ft for 3sec on Touch. Throw Enemies. Touch of Order - 10 - Absorb Health 6pts in 15ft for 1sec on Touch. Frost Damage 7pts in 15ft for 3sec on Touch. Throw Enemies. Touch of Order - 10 - Absorb Health 8pts in 15ft for 1sec on Touch. Frost Damage 8pts in 15ft for 3sec on Touch. Throw Enemies. Touch of Order - 10 - Absorb Health 10pts in 15ft for 1sec on Touch. Frost Damage 9pts in 15ft for 3sec on Touch. Throw Enemies. Touch of Order - 10 - Absorb Health 12pts in 15ft for 1sec on Touch. Frost Damage 10pts in 15ft for 3sec on Touch. Throw Enemies. Touch of Order - 10 - Absorb Health 14pts for 1sec on Touch. Frost Damage 11pts in 15ft for 3sec on Touch. Throw Enemies. Touch of Order - 10 - Absorb Health 16pts for 1sec on Touch. Frost Damage 12pts in 15ft for 3sec on Touch. Throw Enemies. This page was last modified on 27 December 2018, at 19:06.